Gen-Xers may associate Lisa Loeb with the Reality Bites soundtrack hit, Stay (I Missed You) – see the clip below to remind yourself of this perfect pop hit. That’s when I bought my first Loeb album but then rediscovered her music when I had kids – she pops up regularly on the kindie-music circuit, often with another one of my favourite artists, Elizabeth Mitchell. Needless to say, I was thrilled to spot Loeb’s newly released solo album and book combination, Lisa Loeb’s Silly Sing-Along – The Disappointing Pancake and Other Zany Songs. The CD includes four original silly songs and six kids’ favourites (although I didn’t know the ‘favourites’ so it was all fresh sounds for me). The book, beautifully illustrated by Ryan O’Rourke, is packed with song lyrics, dance moves, recipes and other activities to extend the musical fun. The title track, The Disappointing Pancake, is certainly good fun – an epic tale of a hard, flat pancake that is put to use as a sombrero, a bike wheel, a satellite and all sorts of other things. But when my kids took charge of the CD player, there were a couple of songs that were played over and over. We have also had good fun singing along to Fried Ham using different singing voices (opera voice, underwater voice, baby voice), as suggested by Loeb and the ear-worm that is Chewing Gum. The stand-out though, is I’m a Little Coconut. According to Loeb, she used to sing this little ditty at summer camp and the clapping, rattling and ‘Ahoooga!’ actions that go along with the lyrics are irresistible. All the actions are included in the book, along with a recipe for ‘Coconut Cream Pie’. 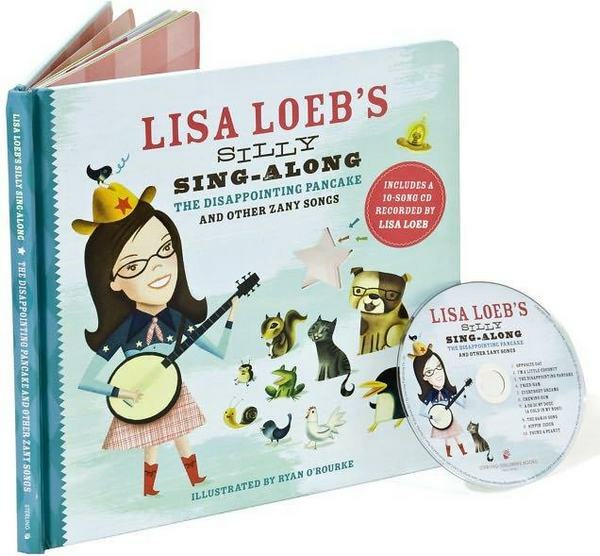 Lisa Loeb’s Silly Sing-Along – The Disappointing Pancake and Other Zany Songs is available with free delivery from Book Depository. It’s suitable for children aged three and over (although the quirkiness of the lyrics gives this CD unexpected cred with much older kids).